On March 16, 2018, professional musicians living with vision loss will demonstrate the world’s first braille eReader at London’s Royal National Institute Of Blind People (RNIB). 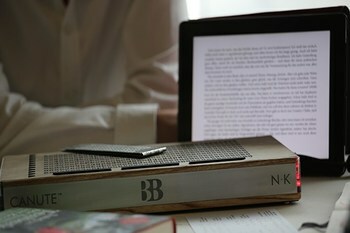 A “Kindle for blind people,” says Bristol Braille Technology in describing their multi-line refreshable Braille eReader. Are you are wondering why blind musicians will demonstrate using the device? It is because the Canute 360 gives musicians the ability to read multiple lines of music at once, a feature that traditional machines lack. Assistive Technology can improve life quality for individuals living with vision loss; SDCB can help.